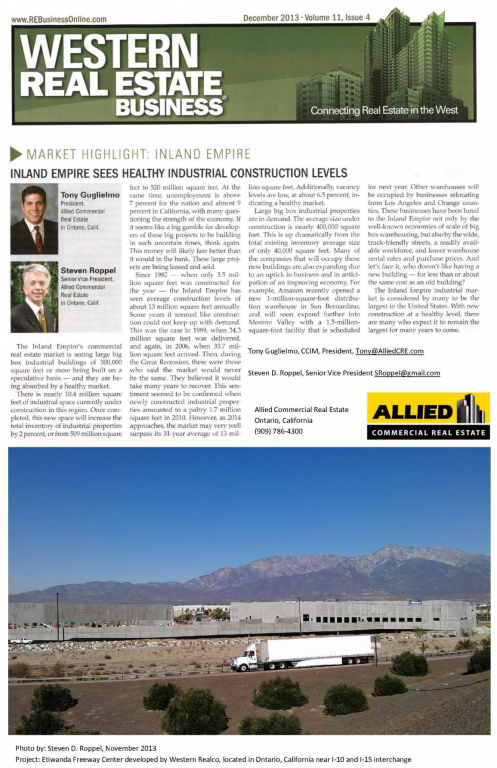 Healthy Construction Levels in the Inland Empire - News - Resources - Allied Commercial Real Estate, Inc. The Inland Empire California commercial real estate market is seeing large “Big Box” industrial buildings being built on a speculative basis – and they are being absorbed by a healthy market. “Big box” industrial is commonly recognized as any space 300,000 square feet or more. Currently there is almost 10.4 million square feet of industrial space under construction that will increase the total inventory of industrial properties by two percent, from 509 million square feet to 520 million square feet. At the same time, unemployment is over seven percent for the nation and almost nine percent in California with many questioning the strength of the economy. If it seems like a big gamble for the developers of these big projects to be building in these uncertain times - think again – it will likely be better than money in the bank. These large projects are being leased and sold. Since 1982, when only 3.5 million square feet were built for the year, the Inland Empire has seen average construction levels of about 13 million square feet per year. Some years it seemed like construction could not keep up with demand, such as in 1989, when 34.3 million square feet were delivered and again in 2006, when 33.7 million square feet arrived. Then, during the Great Recession that ended in 2009, there were those who said the market would never be the same and would take many years to recover – which seemed to be confirmed when newly constructed industrial properties amounted to a paltry 1.7 million square feet for 2010. However, as 2014 approaches, the market may see a surpassing of that average of 13 million square feet delivered in each of the past 30 years with vacancy levels now at about 6.5 percent – indicating a healthy market. Large “Big Box” industrial properties are in demand. The average size under construction is almost 400,000 square feet – up dramatically from the total existing inventory average size of only 40,000 square feet. Many of the businesses that will occupy these new buildings are expanding, due to the expansion of their business, and in anticipation of an improving economy. For example, Amazon.com recently opened a new million square foot distribution warehouse in San Bernardino and will be expanding further into Moreno Valley with a planned new 1.5 million square foot facility for 2014. Other warehouses will be occupied by businesses relocating from Orange and Los Angeles Counties, lured not only by the well-known economies of scale of big box warehousing, but also by wide truck friendly streets, a readily available workforce, and lower warehouse rental rates and purchase prices – and who doesn’t like having a new building – for less than or about the same cost as an old building? The Inland Empire Industrial Market is considered by many to be the largest in the United States and with new construction at a healthy level there are many expecting it to remain the largest for many years to come.